Well, all good things must come to a end. It has taken great thought and reflection on many great years of punishing Teams, but, it's time for a break. I could go into a whole list of reasons for not doing it, but what it really comes down to is, it's become too much work and more of a job. In the beginning it was fun! Now with the more rigid forestry policies, it has became a "Challenge" just to put a "Challenge" on. Now I certainly don't want to put all the blame on ODF. In some fairness to them, the mass amount of use the Tillamook State Forest is seeing certainly has changed the face of our trails and type of damage control needed on them. Over the 10+ years I have been putting the TTC on, I've tried to dedicate the proceeds to "Keeping Public Lands Public". We have contributed thousands of dollars to the Blue Ribbon Legal Fund, Millican Valley Legal Fund, and various TSF projects. The remaining funds will be used for coming projects in the place that made this event possible, the TSF. I want to personally thank those competitors, users, and clubs who have made this event possible over the years. My time has been only a fraction of what it takes to put a competitive event on and without the help of many, nothing would have happened. Respect the forest, it's ours! Thank the forestry workers when you see them for letting us use "our forest"
Get involved in forest and trail management. Hang in there, lifes too short, and getting shorter to not have fun. Many Tks and GOOD memories!!! Test your off-road skills in a competitive event against others in the exciting Pacific Northwest! 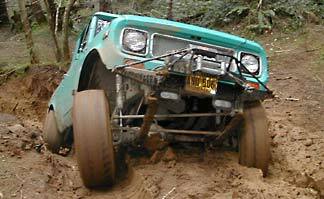 This two-day TEAM event will allow you and your 4x4 to test your preparedness for the unknown! Team Trophy Challenge Information. Includes general information, specific team and vehicle requirements, history and related articles. Application / Waiver. Read, Print out and mail. Schedule. Sample schedule from years past. Frequently Asked Questions. In case we missed something. Comments and Photos. Submitted by our friends! Includes previous years' results and wrap-ups. Links. To other 4x4 related sites (mostly).